First, I want to apologize for the delay between the second article and this one. Scorpion pack is out and this article will not delve into it, but rather talk about the decks we tested for Cycle 2. That does not mean that it is irrelevant; we just don’t expect an important meta shift based on the cards revealed so far. I encourage every Crane player to test their ideas and share it with the clan. It doesn’t matter if we rated a card 2/5 here in the previous articles or if we did not include X card in our decks today; we might still be wrong. If you think that there is potential in a specific card or build, go ahead and start testing with it! If you play a deck that you enjoy but you know that it is not going to be a serious competitive contender, it’s more than fine. Everyone enjoys different things in a card game in different moments. Just be sincere with it and specify that this is more a « fun » or « semi-competitive » build to not mislead some less informed Crane seeking for something more competitive. That being said, let’s delve into the decks themselves! All throughout the review articles I commented on how a number of the new Elemental Cards could be used to potentially increase the usability of Noble Sacrifice, our most powerful card. This deck is that idea realized. This particular list comes from Mike “Doji Neph” George who used it to get second place in the Season 8 Discord League cup. For the most part, it functions exactly like our old Scorpion Splash decks but with the enhancements it gets from the Cycle 2 cards it has become far more lethal and flexible. Calling in Favors: This is still the core reason to splash Scorpion. While a bit trickier to set up than Let Go (because that card HAS no set up!) It still deals with troublesome attachments, potentially turning them into potent strengths, such as stealing an opponents Talisman of the Sun. And while dishonoring a character has always been an anting disadvantage to playing this, the new card Should Beyond Reproach goes a long way towards mitigating that issue. A Fate Worse the Death: While still an incredibly potent card, space needed to be made for the Influence cost of Mark of Shame. Fortunately the increased reliability of Noble Sacrifice takes up the slack, often at a cheaper cost. However, it is still the most reliable tool for taking care of big enemy units, and catching a target with no counters or protective cards will often win the game outright. Meek Informant: Since most of the other splash cards are optimally slotted at 2 copies each, that leaves 1 point of influence to be filled. Meek squeaks in beautifully, scouting the opponents hand and a great tool for political pokes. After all, knowing is half the battle. Mark of Shame: While a bit on the expensive side, Mark proves to be a rather flexible yet situational card. My obvious favorite use is using it to set up Noble Sacrifice, a lethal option if you can catch your opponent with no Cancels and no protective attachments. However, Mark earns its spot in other ways as well. Making an honored character dishonored is not only a massive swing in skill, but removing an opponents honor counter goes a long way towards keeping Voice of Honor online. Additionally, the -1 Pol can actually put even some of the largest bodies in range of being targeted by the Crane Stronghold. Callow Delegate: The 1 coster we needed! The conflict deck is rather expensive, so buying cheap character with no fate is critical too keeping enough fate floating around to buy the big guns later. Callow exist just to poke and die. If he can manage to snag a ring while he’s at it, all the better. Interestingly, it is sometimes better to send him on a Mil attack to attempt a Bonzai since it is often not worth investing fans on him (we want him to die at the end of the turn after all). 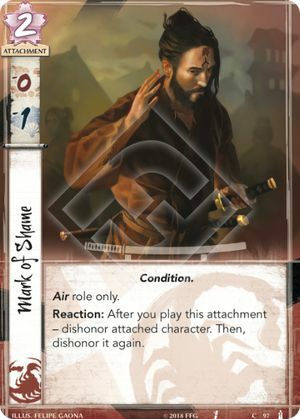 Since there are so many ways to honor Crane characters it is actually rather difficult to find a target to honor when he dies, but fortunately he can honor himself, gaining you 1 honor which can go a long way towards keeping you above honor curve. Magistrate Station: This card is simply brutal. Even if you only get to play it once, getting a character straightened can be a massive advantage. And if you happen to have an Honored Guest of Honor on the board, you’ve pretty much already won. This may be the only province in the game worth spending additional resources to keep from breaking at all costs as the longer it is in play the more it tips the scales in your favor. Just the threat of this card being revealed has many clans re-thinking their poke strategies against us. Menacing Iron Warrior: This is a much needed boost to our lackluster Military force. Her ability is relatively useless but she more than make up for it in raw stats. MIW is a “break glass in case of emergency” card. You need to hold on to her until it appears your opponent is barely breaking a province. The 3 Mil alone should be enough to break, but it is relatively easy for us to get her honored and produce 5 Mil. Her only downside is that she is a 3 cost conflict character, putting her in competition with the much more synergistic Political Rival in an already packed and expensive conflict deck. As such, we should probably avoid running more than 1 of her. Tengu Sensei: This one is a bit of a meta call, and your personal preference may vary. This bird’s ability is incredibly powerful and can potentially lock out your opponents biggest threat from attacking you. Unfortunately, there are quite a few ways to get around his ability (Finger of Jade, Favorable Ground, ect) and his stats are WAY under what they should be for a 5 coster. Personally, I stopped using him after the first time Minds Desire used Togashi Yokui to steal his ability and use it against me. A bit of a corner case, but since my hopes were to use it lock down decks with heavy attachment usage, in my eyes it failed at doing its primary job. Soul Beyond Reproach: Probably the single strongest card we got all cycle. The Crane Clan’s synergy with having honored characters cannot be understated. It powers Voice of Honor, Noble Sacrifice, and take advantage of our high Glory stats. So adversely, being dishonored can be devastating. SBR almost single handedly solves those issues. Running into an opponents Shameful Display is far less impactful, and attempting to dishonor our characters with Court Games is a joke. The only reason I don’t run 3 copies of this card is because we are actually reaching a critical mass of having too many cards that honor people, but frankly running 3 copies would no be the worst idea for anyone interested. I am writing this final section right before publishing, several weeks since I wrote everything else. From that time until now, very little has changed in this deck. Tengu Sensei has largely been replaced by good ole reliable Hotaru, and the numbers of Mark of Shame and Soul Beyond Reproach tend to fluctuate (Some prefer 1x Mark and/or 3x Soul). I’ve even found a single copy of Bonzai Garden can do a lot of damage against Dishonor decks. And while I still feel like this is probably the best Cycle 2 deck Crane can muster before we start playing with the new cards from the Scorpion pack, overall the deck is rather average in meta. Lion and Unicorn are still fairly easy to beat, even with Unicorns new toys. Their best strategies are reliant on powerful event cards that Guest of Honor and Voice of Honor shut down pretty handedly. Scorpion has become a rather favorable match-up. Soul Beyond Reproach prevents our character from being crippled, and the amount of honor token we generate keep us pretty safe from dishonor losses. Their biggest threat, Bayushi Kachiko, can be stopped pretty hard by Mark of Shame, lowering her POL enough to render her ability mostly useless and opening her up to the stronghold. Just make sure Young Rumor Monger or Soshi Illusionist aren’t around to protect her. However, Dragon and Crab remain massive threats. If you cannot manage to get a Noble Sacrifice past their Fingers of Jade and Reprieves they are still going to simply outpace you in the long game. Finally, Phoenix has risen as a real challenger. Uona simply wrecks our mostly non-unique line of characters and Feral Ningyo makes it almost impossible for them to lose water conflicts, turning on many of their water shugenja in the process. Add that to the already oppressive Kanjo District and Isawa Tadaka and Phoenix present a threat that you need to hit hard and fast or they will steamroll you. 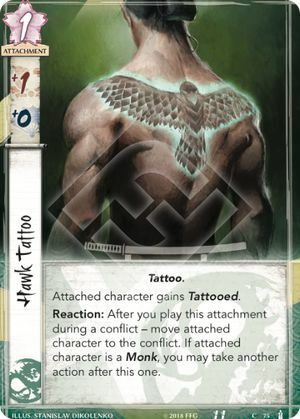 With the errata on Hawk Tattoo (it can now only be attached to a character you control), we have to wonder: is Dragon still a competitive splash in Crane? Personally I think Let Go is still the single best card that Crane can borrow from another clan, but what are the options for the rest of the influence? Hawk Tattoo. Just because it got changed, doesn’t mean we can’t play Hawk Tattoo anymore, right? The problem is that dragging your opponents characters into conflicts was the main use of Hawk Tattoo, with attaching it to your own character being less common. That means the errata took away more than half of the power of Hawkpoon, and as a result I don’t think it is reasonable to pay influence for it anymore. Indomitable Will. There is a reason this card does not see much play in Dragon, where it doesn’t even cost influence. The restrictions of winning and having only one participating characters are too limiting, considering the payoff is paying 1 card and 1 fate for a readying effect. Maybe a 1x is worth it, but I would be uncomfortable playing 2x. Mirumoto’s Fury. In the beginning of time, when we had only the core set, the Dragon splash consisted of some combination of Let Go, Mirumoto’s Fury, and Tattooed Wanderer (at least that is how I remember it). After a while, Fury came to be considered the most powerful card of the three. Then, everything changed when the Restricted List attacked. The consequence for Crane/Dragon is that you have to pick between Fury and Policy Debate. Personally I don’t think Policy Debate is all that amazing. The effect is obviously very strong, but in my experience it is actually not that easy to get off. With the Crane stronghold, your opponent is unlikely to put characters with low political skill into political conflicts. So most of the time, you have to commit a high political skill character of your own to a military conflict to get a favorable duel. It feels great when you pull it off, but how much did you really sacrifice by committing characters the way you did and/or having PD dead in hand for a while? Even so, picking Fury means you have to fill the 2 or 3 empty slots left in your deck by removing PD. Those cards will inevitably be your 39th and 40th best cards, and having to include them is a real cost. Moreover, there are many cards that make Fury less attractive by readying characters: it is weak against Ready for Battle, Against the Waves, Steadfast Witch Hunter, Magistrate Station, Gaijin Customs. I think Fury is still a valid option, but these drawbacks make it tempting to look for something better. Ancient Master. A 1/1 conflict character for 1 is a strong baseline. The text box is completely irrelevant, but the 2 glory can help grab favor or defend Shameful. Despite the synergy with Yoshi, I think Ancient Master is ultimately a bit worse for Crane than his ‘older’ brother coming up next. Tattooed Wanderer. If a 1/1 for 1 is strong, what is a 2/1 for 1? The second skill point is useful quite often. Military pokes with 1 skill are common, and this guy can succesfully defend those on his own. And then there is the attachment mode. Covert is the best keyword you can find, and stapling it onto any character for 1 fate is no joke. Attacking with covert is a big threat on stronghold attacks, and that goes both ways: when you are defending, making your biggest guy immune to covert is also good. For now, 3 Let Go and 2 Tattooed Wanderer is the Dragon splash I am most excited about. But you probably already knew that TW is a pretty solid card. The more important question is whether it can compete with the various Crane/Scorpion builds that utilize some combination of Calling in Favors, A Fate Worse Than Death, Mark of Shame, Meek Informant, and maybe Forged Edict. At the start I already indicated what the major draw of splashing Dragon is: an innocent little card called Let Go. Let’s compare it with the attachment control in Scorpion splash, Calling in Favors. The latter is probably a bit better if you can steal a Reprieve, Spyglass or Talisman of the Sun. On the other hand, Let Go is a far superior answer to Cloud the Mind. In some matchups your only target might be Fan/Katana, in that case I think Let Go is a bit better but it won’t matter that much. There was one smaller, but important update in the Rules Reference. You can now steal back your unique attachments with Karada District after they get stolen with Calling in Favors. This is a significant blow to Calling in Favors, because the ability to steal a Talisman of the Sun from a Crab and then have them unable to steal it back or play another one was gold. And if you think there is only one Karada in their deck, remember there are probably also 3 Miya Satoshi and 3 Rebuild! In the end the Scorpion splash has a bit more control and big swings, while the Dragon splash continues to be lean and aggressive. Changing Hawk Tattoo did not kill it any more than restricting Fury did, because Let Go is the core of the splash and there are still great cards to combine it with. The deck I will present today is a Crane/Unicorn keeper deck. I don’t think that the deck is as competitive as a Dragon or Scorpion splash right now mainly due of the lack of strong attachment hate. That being said, it’s not by any means a weak deck and is a ton of fun to play. I can see it producing good competitive results, just not with the consistency of our others « main decks ». My testing showed me that while filling the deck with a lot of attachments and cutting on events was exciting conceptually, it removed one of the main strengths of our Clan that allow us to still do well in a very competitive meta: the ability to do early game pressure. I ended up on a version that played strong attachments while not cutting too much of our events, but I am sure everyone can have different versions of the ideal Crane/Unicorn deck in mind. I will go into details in the next section, but I’d like to explain what the deck mainly does: It is a slower Crane deck that tries to build one or two 3+ character with a good number of attachments and ready them with Magistrate Station or Gaijin Custom if possible. I was surprised to find that it has no absolutely terrible matchup. Fighting against a Karada District for example might be an uphill matchup but if Crab does not flip it, the matchup is actually quite good. Building and testing a Unicorn/Crane decks involves making a lot of choices, both in deckbuilding and gameplay. That leave us with some weak points that we should not ignore. Let’s see what they are and how to play around them. This only really matters in early game and thus is strongly tied to the second weakness that we will see next. The deck does not get free fate for revealing air province and does not even run Manicured Garden. Moreover, three of our attachments (Spyglass, Talisman of the Sun and Above Question) that we might be tempted to play early on cost 1 fate. 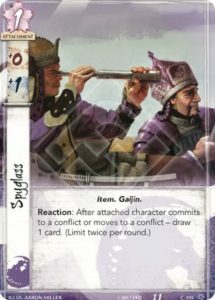 To take maximum advantage of the Crane/Unicorn deck, we will have to get a 3+ cost character on the board and start putting Fantana, Spyglass and Talisman of the Sun on them. This leads to some hard decision making in the early game because Crane usually want to play cheap characters turn one to be aggressive and effective as soon as possible. Ultimately, the line that you are going to choose turn one with this deck will depend on the matchup and the flips. Sometimes, it’s better to stick to the « cheap character/early aggression early game » and only play 3+ fate character later. The downside of this is obviously that each attachment we will play this turn will have a more temporary value than if it was attached to an important character (being forced to play a Talisman of the Sun on a 0-1 fate character will happen a lot in those cases but is not ideal). On the other hand, sometimes you will feel like that going for a single 3 cost character with 3 fate turn 1 and start piling on attachments can be a good decision. Be careful to not be overwhelmed for the turn as the Character itself already cost 6 fate and Spyglass/Above Question/Talisman cost one additional fate for each. You don’t want to lose too much ground early as a Crane. This is the main reason while most Crane players don’t see the Unicorn splash as viable despite its advantages. It is worth noting that there is still attachment hate but not in the conflict side, which brings a factor of unreliability. The first tool is 3x Miya Mystic. Yes, Miya Mystic is bad and rarely shows when you really need it but it is still a necessary evil in a deck that can hardly deal with some overpowered attachments like Reprieve or Talisman of the Sun. The second tool is Frostbitten Crossing, an air province that had been tested in the past in our seeker Crane decks but with no success. Here, it is way better because we run Talisman of the Sun and there is a lot of situations when we will be able to redirect a conflict involving characters with attachments into it. By choosing to not play an overwhelming amount of attachments, we are somewhat still weak to Let Go and Calling in Favor. That being said, the deck still has the critical amount of attachments needed to make it worth it but it will requires some smart scouting/deduction of your opponent’s hand. – Get access to their hand by using Policy debate or let them break Upholding Authority. If I see no attachment hate, great, the way is clear for now. If I see some, I discard it unless I see some other very critical cards here. – Voice their attachment hate: This is not always worth it because Voice has so many useful targets in a lot of matchups, but sometimes, you really want to protect your Talisman of the Sun or Above Question, especially if it’s a Calling in Favor coming. – Try to bait with other attachments: Never play a Talisman hastily. It’s your most vital attachment and the equivalent to the Queen in a chess game. If you still think you will have to play a Talisman this turn, and you are unsure of the amount of attachment hate in your opponent’s hand, try to bait first. Some weaker/uninformed players might take the bait on things as simple as Fan/Katana but the others will probably keep their attachment hate for Spyglass. Sacrificing a Spyglass to protect a Talisman later is a trade that you should be ready to make. Specific to this list. This is probably the big one. Political Rival is usually a top conflict card for us and consensus is that we should at least play 2 of them. The thing is that it’s still a 3-cost conflict card and the Crane/Unicorn deck requires to play a lot of 1 fate cards while not having the help of the Seeker province fate early game to help us, so sacrifices had to be made economy-wise. Also, the Crane/Unicorn playstyle incites us to put a good number of attachments on only one or two of our characters and if possible, make them participate in several conflicts a turn. Having a dash in the military stat hinders this strategy, making it less flexible. That being said, Political Rival is still a beast of a card and finding room for a second one if you can is hardly a bad idea. By removal options, I specifically want to talk about cards that can get rid of an opposing character. The two that we usually see in Crane decks are Noble Sacrifice (played in 1 or 2x usually) and in Scorpion splash, you can find Mark of Shame to trigger Noble Sacrifice more easily and A Fate Worse Than Death. Basically, this deck has Dragon splash level of removal but not Scorpion splash. Is it bad? Not really in a world where every Clan focused on big characters usually have some layers of protection, making the effectiveness of removal somewhat dicey. Additionally, the Crane/Uni deck is more focused on building and boosting your own board than disrupting the board of your opponent (don’t get me wrong, direct disruption is still a thing that every Crane deck can and should do to some extent, but we just are not forced to go all the way with Unicorn splash). Rally is no Entrenched position. Entrenched allows us to defend many military attacks on our stronghold while Rally will generally only delay our defeat a little, making any smart opponent able to deduce our stronghold province by scouting it first with a political poke. If a military Clan is in your Stronghold, Rally will probably not be your life saver but fear not because there is still one and it’s called Talisman of the Sun. Forcing the opponent to possibly break four good provinces instead of breaking your stronghold is huge. Alternatively, Rally to the Cause can even be an upside against Lion if you decide to play it in your row and your Lion opponent is unlucky enough to go in a full military attack against it. (It does not work well vs Unicorn due to Captive Audience). I was unsure if I should mention this one because my version of the deck made the choice to keep a lot of this « raw power » by only cutting one assassination (seen in 2x in a lot of decks), one Banzai (already cut in a lot of decks) and one Fine Katana. You can consider this accurate for most of the other Crane/Uni builds we’ve seen so far; many of which have been able to cut all Banzais. Now that we reviewed all the weaknesses of this Crane/Unicorn deck, we can start to delve into what makes it worth playing. Even without Talisman of the Sun, I find the province row quite good. Magistrate Station, Shameful Display and Upholding Authority are very strong provinces. I have tried to make Upholding Authority fit in my Seeker deck because of how good it was in my Keeper testing but with no success so far and a good hit from Upholding Authority can very well be game winning. It is also a relief to have a province that we don’t feel bad not defending. Then, there is Frostbitten Crossing. Even without Talisman of the Sun, it might surprise your opponent and get some good value but it’s still the weaker of the row by itself. This is something Crab decks do very well: the more the game progresses, the more you are likely to gain value and win in most matchups. This « inevitability » factor is due mainly to the power of Spyglass (generating a crazy amount of value the longer the game goes) and Talisman of the Sun (Which if unchecked can just put your opponent in a lose-lose situation). Can be tied with inevitability. Mainly true if you have some Spyglasses action going as you will be able to draw a lot of cards, allowing you to feel less forced to bid more in a situation in which your honor can be low. I have even been able to honor choke my opponent this way a few times. I think this card should be on restricted list. It is not and it’s better for the deck. Like I mentioned before, Talisman of the Sun is the equivalent of the Queen in a chess game. If you can use it successfully without it being taken out, your odds of winning the game are quite high. The whole province row has been thought to be in synergy with Talisman and offer you a solution in almost any attack you will have to endure. There is no way you will be able to defend an attack but still want some value of it? Redirect into Upholding Authority. You really need more stats into the conflict to win it and honor your characters (or even setting up Noble Sacrifice)? Redirect into Shameful Display. You are winning this conflict easily and your Magistrate Station is face down? Redirect into it to be able to un-bow your main character full of attachments for the rest of the game. They are dishonorably attacking your Magistrate Station and you won’t be able to defend this? Redirect into another province, preferable Upholding Authority if it is not yet broken. You play against Lion, they have a big military attack and you don’t want to let them win, trigger their Stronghold or get the ring effect? In this case, you probably had Rally to the Cause in your row. Invite them here and bring some tea. They are on your Stronghold, threatening a break? You can save precious time and going for a deadly counter-attack by redirecting on your fourth unbroken province on your row. I know, it does sounds like some sort of publicity advertisement but it’s as strong as its looks. Some might ask: Why does the deck plays only 2 Talisman of the Sun if it is that strong? Mainly because you can only have one in play at the same time, making the other copies in your hand dead but also because Spyglass helps you drawing the two copies that you need and that an unfortunate Calling in Favor unto your Talisman (something that you should avoid at nearly all costs) just makes you unable to play another. If Talisman is the first argument for going Crane/Unicorn, I have found that un-bow is the second one. Un-bow/Ready techs is an option that Crane has severely lacked in the past and Magistrate Station repaired some of this injustice. While being very good in other Crane decks, Magistrate Station is at its peak in a Unicorn keeper splash because of your ability to protect it with Talisman or Disdainful Remark and the increased value to un-bow characters with a lot of attachments (triggering spyglasses that much more easily). However, Magistrate Station is not the only card that allows us to un-bow in the deck: 2 copies of Gaijin Customs are here. While being somewhat fragile in a Seeker splash, Gaijin Customs is much more reliable in Keeper splash because of the increased influence cost. It is also a very hard card for your opponent to plan around and it can lead very often to surprise breaks, disrupting your whole opponent’s strategy for the turn. Disdainful Remark was a card that I was skeptical of first and decided to give it a try for its obvious synergy with Magistrate Station. It turns out that as a 1x in a meta where almost everyone like to bid high, it can do much more than that. There will be situations where Disdainful Remark can save a break against your Stronghold or just help you focus on the offensive. One of the upsides of the card is that it’s not expected at all in the meta, so you will see very few players, if none, playing around it. Keep in mind that this card loses effectiveness in honor pressure situations because you are incentivized to make your opponent bid higher if you have it in hand. Above Question is great against Crane or Scorpion conflict deck, Assassination in general and Void Fist. It is also a potent tech against Phoenix if played on their big characters, preventing them to use cards such as Clarity of Purpose, Against the Waves or Supernatural Storm on their main character. One copy of Above Question could be replaced by Finger of Jade (better against Province and character’s ability but one use only) or Cloud the Mind, depending on your need. Storyteller finally find a home… ! Or Almost. I first tried a version of the deck with 2 Cloud the Mind, but I was disappointed with the results and thought that the deck should avoid running too much situational cards. I ended up removing the CtM but keeping the Storyteller because the deck revolves around some high cost characters getting attachments and it turns out that Storyteller stats are actually not bad. As a draw engine, Storyteller usually let me draw 2 or 3 cards in average during a game which is obviously good value and because the deck is more « Long term value oriented » than many other Crane decks, I am more than fine getting those cards in a delayed manner. Advice: Avoid playing Storyteller vs Phoenix. It’s a non-unique and Shugenja character. It will generally end up a tsunami-level disaster. While I feel like I covered Spyglass in the earlier sections, I did not mention Wayfinder at all until now. He is only a 1x, not because he is a bad card, very far from it, but because I found out that the other Unicorn cards in the splash are a higher priority. It’s still a fourth 1/1 for 1 (which is never bad) in the deck. It can enable Gaijin Custom and can work around the very deadly Dragon provinces. I am always very happy to find it in my opening hand. No Honor deck will be totally viable, but I tried this one and had a lot of fun with it. The idea was to make a deck that can honor out while not being completely janky, so I cut the cards that could have fit into the deck theoretically but were too weak, like Fu Sui Disciple. The deck is not supposed to win on honor every time but in my testing, it did half of the time. You must keep your options open and choose the winning condition that seems to fit the situation the most. Do not bid 1 turn 1 with this deck, bid 5. Switch to 1 bid only once you are comfortable with the current state of the game. I really want to get 3x Keeper Initiates in the deck because you are incentivized to take Air ring in this build, but I couldn’t find the room for it. If anyone can achieve this, please let me know!